28 Jan 2019 --- As the UK heads towards the increasingly likely scenario of a “no-deal” Brexit, a potential spike in food prices and the issue of tariffs has come under the spotlight once again. In the absence of a Brexit deal – a so-called “hard Brexit” – the UK will become a “third country” to the European Union. In practice, this will mean that UK companies lose access to the EU market for exports of most agricultural products, due to the introduction of import tariffs at the EU border, according to the latest analysis from Rabobank. Entitled “Consequences of a ‘Hard Brexit’ for Food & Agribusiness,” the Rabobank report says that it is most likely that the UK will not introduce import tariffs for imports (from both the EU and other countries), but nevertheless, food price inflation in Britain can be expected to rise. This is due to the increasing costs of crossing the border with the EU and a further weakening of the British pound, because the UK is a net food importer. RaboResearch Senior F&A Analyst, Harry Smit, tells FoodIngredientsFirst that the chances of imports from other countries taking over the role of EU suppliers are small, at least in the short-term. UK quality standards are not easy to meet for most suppliers outside the EU, while the UK market competes with many alternative destinations for exports. Raw sugar is the only product for which we may see an increase in imports. “The loss of the EU as an export market will have an impact on those that export to the EU today. For example, grains are exported to the EU, but also parts of the animal carcass in the case of pork, beef and poultry, and certain dairy products (soft cheeses),” he explains. Furthermore, whisky will be subject to EU-import duties too. Though these exports in most cases are relatively speaking small (except for whisky and grains), they may push down the return of the processors of agricultural products as they can no longer maximize the total value of the raw agricultural product. “The larger the dependence on export the bigger the impact,” Smit explains. Poorer members of society could be impacted more because they spend a larger share of their income on food, says Smit. The administrative burden of trading with, or having operations in, both the EU and the UK will rise, according to the report. Customs controls will not only lead to higher costs of border crossing, but time spent at the border will also increase, which is detrimental for the quality and value of fresh produce. A highly sensitive issue will be the border crossing between the Republic of Ireland and Northern Ireland, as the “Hard Brexit” scenario entails a hard border between the two. Last year, another report into food safety issues post-Brexit hinted that checks on lorries transporting perishable goods could be suspended if there are significant delays at the border. In the Food Brexit Briefing, leading food policy specialists urged the UK Government, food industry and consuming public to remain focused on food because a “careless Brexit” poses significant risks to food flows into and out of Britain. There are also concerns that border control food safety checks will very quickly lead to disruption and delays at UK entry ports because loads will have to be checked one by one. Even a check of a few minutes could quickly lead to congestion. Food companies will have to reorganize their supply chains to adapt to the new realities of trading post Brexit. Efficiencies based on cross-border EU-UK value chains will be lost, says the report. In the absence of a trade deal, World Trade Organization (WTO) tariffs will apply to all EU imports originating from the UK, just as they apply to imports from other third countries. For agricultural products, these tariffs are significant and oftentimes prohibitive for trade. This will lead to UK suppliers losing access to the EU market, the report predicts. Although the UK is a net food importer, for many products it is also an exporter. Value chains in food have a cross-border character while raw agricultural products consist of various components (such as various parts of an animal’s carcass) that cannot always be sold in one and the same market. Part of the damage incurred by UK farmers due to the loss of access in the EU market will be compensated for by a further weakening of the British pound, as it improves their competitive position vis-a-vis imports. “The UK is a net food importer, therefore, it would be in their economic interest to not apply import tariffs. Food price inflation as a result of import tariffs in our view would politically not be acceptable,” Smit adds. As UK producers become more competitive, imports become more expensive. Also, the supply of immigrant labor will decline, because the return on working in the UK will come down, he notes. The Rabobank research says that it does not expect the UK to lower its quality standards compared to today’s situation. Therefore, imports from non-EU countries will be limited, at least in the short-term. This will especially be the case for sectors in which suppliers from third countries face difficulties meeting these quality standards. For example, hormone-treated beef, chlorinated chickens, GMO grains and oilseeds of varieties that have not yet received EU approval are currently prohibited in the EU and the UK, the report notes. Furthermore, private sector standards, such as animal welfare standards in pork, create barriers to imports from suppliers that are not compliant with UK standards. When it comes to the potential depreciation of the pound, Rabobank says that in the case of a “hard Brexit,” it expects the pound to slide towards parity with the Euro. This would mean a depreciation of the GBP versus the Euro of around 10 to 15 percent. Domestic prices of most agricultural products can be expected to increase by this percentage because the UK is a net importer for most agricultural products and will therefore see a rise of import prices to the same degree. This will also pull up prices of domestically-produced products. UK farmers will benefit as prices rise, while consumers will see food price inflation rise. Furthermore, margins in food processing and marketing may come under further pressure. 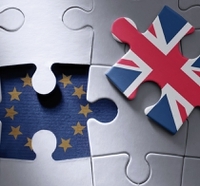 Earlier this month, the Secretary General of the European Dairy Association, Alexander Anton, spoke with FoodIngredientsFirst warning of the “catastrophic” impact that an increasingly likely “no-deal” Brexit scenario would have. He foresees repercussions that are far more severe than the Russian ban on dairy imports in 2014, with “a whole new scale of crisis” on the cards. While contingency plans are already in place in terms of stockpiled dairy ingredients, likely consequences will include a temporary consumer price increase on UK sold dairy products in the EU, as new supply chain systems are considered. Just last week, another report from UK consumer research company NimbleFins, examined the potential impact of “no-deal” tariffs on the average weekly shop of UK residents as well as the impact a hard Brexit would have on takeaway/restaurant spending – and it shows grim consequences for British consumers. The results find that a year's worth of tariffs could come to the same amount as two weeks’ worth of groceries and money spent eating out – regardless of budget. Brexit European Union Tariff Inflation Food Agri-Business Agriculture Farmers Supply Chains Rabobank No-Deal.